I hope you all had a wonderful and loving Christmas with your families and close ones. I took a mini break from blogging for the day although I did share a little Christmas message with my followers over on Facebook. You are probably planning your New Years Eve outfits at this stage so I’ve shared this lipstick review as I think it’s the perfect red lipstick to ring in the new year with. Just “Click to View Post” under the image to continue reading and check out the photos/swatches. I picked up this lipstick in Boots a few weeks ago for my Office Christmas Party look. 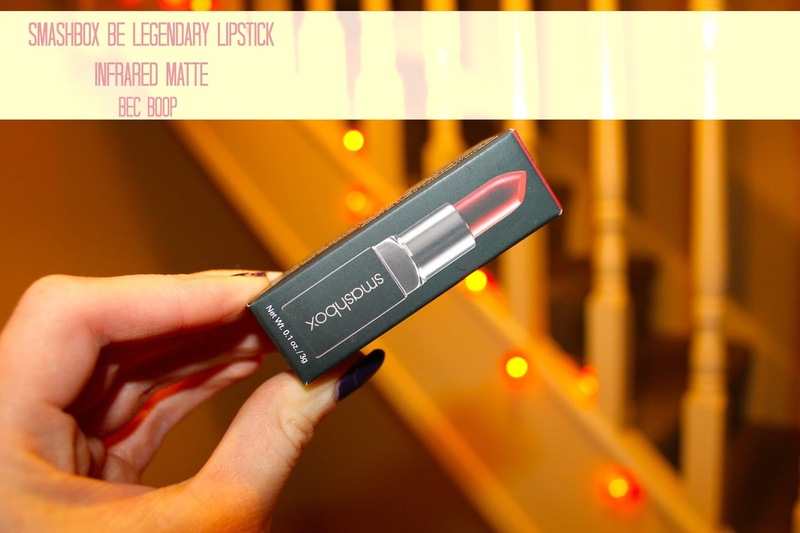 It is the Be Legendary lipstick from Smashbox Cosmetics in shade Infrared (matte). I was on the hunt for a dark red lipstick which would see me through the Winter season and this one was the recommended choice. It is a very deep but still vibrant shade of red with a matte effect. This was my first try of the Be legendary range from Smashbox and I was super impressed! I used the lipstick over a red lip-liner from Urban Decay (24/7 glide-on lip pencil) and the overall look was really long-lasting. The formula is fantastic and my lips looked really hydrated for the night.The fear with a red lippie is that dreaded red line around the outer line of your lips after a few hours but it made absolutely no appearance when I’ve worn these two products combined. I love the packaging as it’s sleek and will fit nicely in your handbag for emergency touch-up’s. I also wore this around London recently which you can see in this Vlogmas video. I was equally impressed with it’s use for a daytime lipstick look. I think this shade of lipstick is great for a New Years Eve party as it has that festive yet classy feel to it. As it’s a matte effect too you can always add some gloss on the top to complete the look depending on your personal preference. I’d love to hear from you in the comments below. Have you tried this lipstick before? What’s your go-to New Years Eve party lipstick? This is Crimson. This is prog rock. I gotta recommend this lipstick 2 prog rocker females who go 2 shows, b it King Crimson/not.